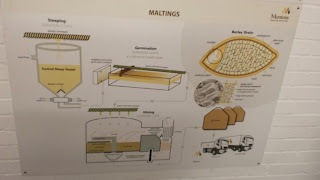 As promised the excellent Joe Hertrich has returned to the Master Brewers' Association of the Americas podcast to talk some more about malt. This time it's about the bits missing from his last talks: flavour and aroma. Unlike colour flavour and aroma cannot be defined by a number but are defined by kilning technique. Though steeping and germination are fairly uniform throughout the industry there is a lot of variation in kilning. It is the most energy intensive process in malting due to the electric fans and fossil fuel heat. Unless you have a dialogue with your maltster they will focus on meeting the specs on moisture, colour and not destroying DP (Diastatic Power). Colour, flavour and enzymes are liked. Flavour compound development is parallel to colour development and enzyme destruction. For example, distillers malt has very low colour and very high enzyme content. Pale malt has more flavour but less enzymes. Very little flavour or colour is created below 60°C (the temperature distillers malts are kilned at). If the same green malt split and kilned to make distillers malt and pale malt the distillers malt will have 220 DP and the pale malt 140. Enzyme conversion creating Maillard reaction precursors happens around mash temperatures (63-68°). Simple enzymes will have been created already in well modified malts and simple sugars will be created in the kiln at these temperatures. Amines and sugars are the Maillard precursors. This conversion phase can be controlled to emphasise it or de-emphasise it. Green and grassy flavours are eliminated in the kiln at around 80-85°C. Lipoxygenase is also eliminated at 85°C (so why use null lox barley?). At high temperatures and low moistures Maillard reactions create melanoidins. Light melanoidins are biscuity and toasty, dark melanoidins are more like coffee and black chocolate, with toffee flavours in the middle. Caramelisation does not happen in the kiln, only in the roaster. Withering is the free drying of surface moisture of green malt. It is carried out with high air flow and low temperature and the moisture content goes from around 45% to 12%. High humidity air will come off the kiln. At the break point when the free moisture has been drive off curing starts and the bound moisture is removed with high temperature air which will leave the kiln at low moisture content. The moisture content will from from 12% to around 4%. Each of these phases uses half the kilning energy. Lager malt is designed for adjunct brewers. It as minimal flavour and is made with very rapid air flow but minimal temperature so minimal Maillard reaction precursors are formed and minimal melanoidins created. It is cured at 80-85°C just on the borderline of driving out the green and grassy flavours. It will have low colour, high DP (140) and lipoxygenase will still be active. It's not the best base malt for all malt craft brewers, who should look to other malts. English pale ale malt is the strongest base malt, better than US pale or German pilsner. Kilned with rapid air flow and low temperature until the break point and then cured at a higher temperature than US pale, 90-105°C at the end when moisture very low. This give twice the colour of US pale at 7.1 EBC. It's not unusual to have UK pale malt at less than 3% moisture. DP is 90 or 100 with no lipoxygenase. The real value is in the flavour notes though: no raw grain flavours whatsoever. Light melanoidins formed by the little Maillard reactions there were, giving a toasty biscuity flavour. Much cleaner and with all the green grassy and weak aroma eliminated. German pilsner malt lets you produce a German flavour: grainy and high in DMS. In the US for English type pale malts you want "high dried". The light Munich types start with significant recirculation and hold when still above 25% moisture to get ezymic conversion before the moisture is gone and significant Maillard reactions occur. When heated to 100-105°C you get malty and sweet aromatics due to Maillard reaction products. If you're after flavour you will have to accept higher colour and lower DP, but Munich malt will still have enough enzymes for starch conversion. "Lower colour expectations are the enemy of malt flavour". Maltsters looking for low colour will first have to seek low protein barley and make less modified malt so the amount of simple amines is reduced. But this reduces overall malt functionality and extract. Then there be low temperature, high flow klinings with minimum cure temperature to avoid melanoidin formation, but this risks green grassy notes. It makes no sense to use very pale malts with darker speciality malts. Roasting is carried out in very small batches compared to white malts, also for a short time (2.5-3) hours. Malt is put in a drum and heat applied. This can be done without drying, which you can't do in a kiln. You can apply heat to low moisture grain but most roasters are loaded with green malt directly from germination at around 45% moisture. You can put it up to mashing temperature and do mini-mashing in the roaster. Temperatures can go up to 175-260°C, depending on the depth of the flavour and colour required. Caramelisation of sugars will occur, and all enzymes are destroyed. If barley variety makes a difference to malt flavour it is very small. Differences in malting processes make much greater difference, both between different malting plants and the different processing and kilning that different barley varieties may need to make malt of the same specification. So though flavour differences do exist they are due to the malting and not barley genetics. Nice write up, I've seen some slides about barley variety recently though, comparing full pint etc. It's a bit of a shame that they didn't get David Quain on the draft line talk with his latest paper but it's very good also. That fact you'll have to alter the parameters to malt different barley varieties shows you will get some variation in flavour, but I'm sure it's small compared to other factors. They had Graham Stewart on recently so I'm sure they could get David Quain. I beg to differ with your conclusions, as a home maltster myself, varietal is a telling factor when producing pale & pilsner type malts. I don't believe I'm alone on this.
" I don’t think it’s due to kilning practices, I don’t think it’s due to malting practices, I think it’s due to varietal differences"
There are two schools of thought on this one! I think Joe Hertrich makes a good case for the barley variety doesn't matter opinion. Golden Promise barley is malted by both Fawcett, Bairds and Simpsons, who all produce a malt that is highly interchangeable. The varietal is the telling factor here, not slight differences in the companies malting regime. Bairds, Muntons, Warminster, Crisp and Fawcett all use Maris Otter barley from Hampshire, Norfolk and Yorkshire and they are all very similar and interchangeable. The telling factor is, once again, the varietal. Not where it was grown or how it was malted. Both Fawcett or Bairds Golden Promise malt cannot be interchanged with Fawcett or Bairds Maris Otter Malt, they are simply not the same. Interestingly, Viking and Maltosa in Lithuania both produce malt from several barley varieties both local and foreign, with the end result that Lithuanian malts seem quite high in protein (11-13%) compared to similar malts from other more established countries, Western Europe, USA, etc (8-10%). Here it seems that local climatic conditions invoke changes to the barley and thus the finished malt, mostly in its amino acid profiles. Lithuanian malts are similar regardless of barley type with their unique tastes based on their barleys "terroir" it would seem, rather than their varietals. Try some local pale Lithuanian beers/ales and you will spot that unusual straw-like flavour immediately. It's a very complicated story. I should write it up into a post someday.